Early Start French 1 - 07 How old are you? Ch.7: Quel âge as-tu? : How old are you? "Je m'appelle Amélie, j'ai 10 ans." and "Je m'appelle Alexandre, j'ai 7 ans." The video shows children of a wide range of ages. Most French children go to a nursery ("école maternelle") from age 3 until they have to start primary school at age 6. They spend 5 years at their local primary school ("école élémentaire") until age 10-11, when they go to the nearest secondary school ("collège"). 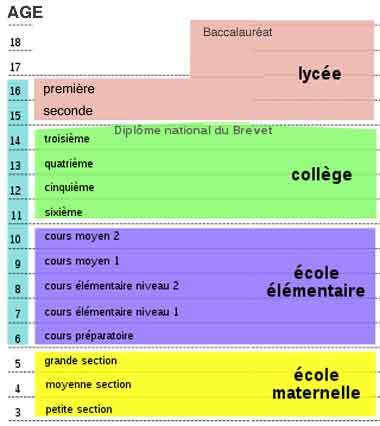 At age 14, they go an upper secondary school ("lycée"): some will leave when they are allowe to, at age 16. Many young people stay on at "lycée" until they are 18, to take the "Baccalauréat" exam, which qualifies them to go on to university. This website (link below) has a very useful description of the French school system and current issues in education in France (in English), which gives more cultural background - suitable for teachers rather than KS2 pupils. For comparative information covering France and other European countries, teachers could look at Eurybase, the EU-funded EURYDICE database. For each country, the information is available in English and in the countrys' national language(s).